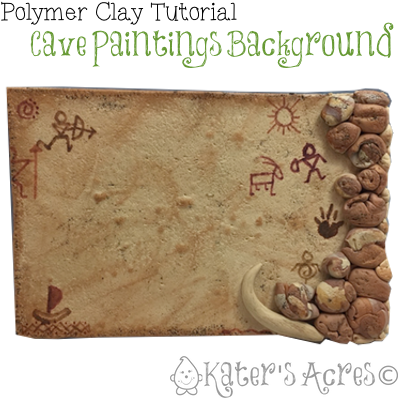 This cave paintings background tutorial will show you how to make your own backdrop for your prehistoric creations. Whimsical Sculpting Tutorials Club members are taking a journey through time this month with our Prehistoric Theme. You can make this cave paintings background any size you’d like. Exact proportions are not given as your size and needs may vary from my own. Experiment with your figurines even incorporating this background into a shadow box for them to “live” in. Obtain a piece of cardboard, canvas, or other study material in the size you need. You will be covering this with polymer clay. Roll your ecru clay through your pasta machine at a thin setting to make a type of faux fabric. Be sure you have rolled enough clay to completely cover your cardboard. Roll your clay until it is thoroughly conditioned and the right size to completely cover your piece. Place a medium amount of white glue all over your cardboard or other sturdy backing. Place the clay on top of the glue. Trim the clay so it is flush with the edges of the backing board. Use a piece of sandpaper to texture your clay. TIP: Do NOT worry about air bubbles. Once baked it will look like variations in a rock face and they will work FOR you. Make a blend with all kinds of ecru-brown-red-bronze shades of clay. Roll through your pasta machine but do NOT completely blend. You want your rocks to look varied and random like they do in nature. Tear off random sized pieces and lightly shape into “plops” with ridges and grooves to resemble rocks. Place on top of your textured backing board wherever you see fit. Use the graphic below as inspiration and “draw” your own cave symbols (literally doodles) onto the ecru backing clay using a very fine liner paint brush and alcohol inks of your choice. Bake at recommended clay temperature for 45 minutes in a dedicated polymer clay oven. Once your background has completely cooled you are ready to add the “age” to the cave wall. Distress crayons and inks are a great option as they are easy to use and give an instant “aged” appearance. Take a medium/dark brown Distress Crayon and literally draw a “line” all around the outside of your faux wall. Use your finger like a brush and literally “rub” the line downward and to the inside of the canvas. If you are having trouble with this, slightly wet your finger and watch the magic happen. You can do this all over your piece and grunge it up as much as you want. I prefer this method to acrylics for this as I don’t want to effect to get carried away. Lastly finish your design by using a light brown chalk ink on the surface of the sheet randomly. Be sure that you hit all those air bubbles so that they “pop” like real rocks have indent, outdents, and other cool features. TA-DA!!! That’s it, you’re done! Now just add your prehistoric figurines and you’ve got a cute little display set.